Morning Warm-Ups are a great way to get kids thinking about Math, Language Arts and Geography for the day and to 'warm-up' their brains! 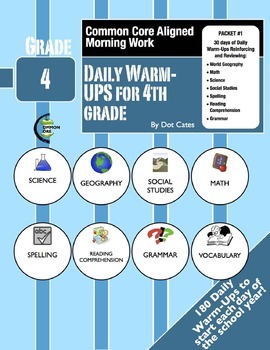 ‘Common Core Aligned Morning Work: Daily Warm-Ups for 4th Grade’ Student Activity Book provides an excellent review of Language Arts and Mathematics Common Core Standards for the fourth grade. In addition, most Daily Warm-Ups require students to use an atlas and read and interpret maps, identify places in the world, and become familiar with world geography. 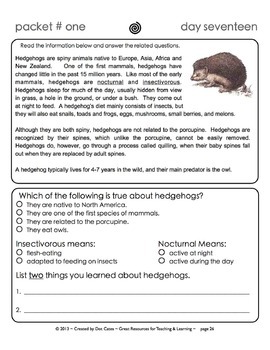 Science and Social Studies concepts are introduced through reading comprehension exercises. This first packet out of six serves as a review. The Geography focus is on North and Central America, as well as fundamental map reading skills and the compass rose. In addition, fourth graders will review a wide range of basic third grade common core skills in both Math and Language Arts. 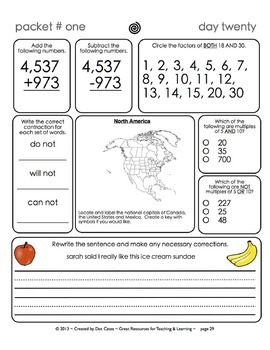 This bundle includes a key as well as a list of aligned common core skills. 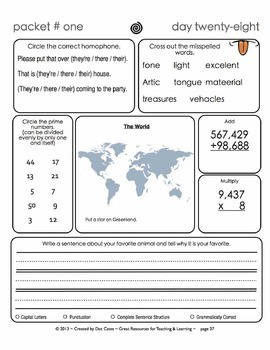 Stay tuned for additional Common Core Morning Warm-Ups Activity books for Fourth Grade - coming soon!